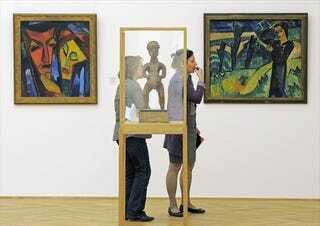 Visitors stand in front of paintings of Karl Schmidt-Rottluff during the reopening of the Albertinum, a museum of the Dresden State Art Collection (SKD), on Friday, June 18, 2010. The Albertinum dedicated to art from the last 200 years. Originally built in 1559, the Albertinum was badly damaged by bombs in 1945 and again by flooding in 2002. The 51 million Euros renovation took more than five years to complete. The new exhibition halls are shared by the Galerie Neue Meister and the Skulpturensammlung. The holdings of both museums, with paintings ranging from Caspar David Friedrich to Gerhard Richter and sculptures ranging from Rodin to the 21st century, have an outstanding worldwide reputation.